A fantastic seasonal salad with a powerhouse of nutrients – Blood Orange Salad with avocados, olives and some chickpeas on a bed of watercress. The sweet juicy blood orange balances out the invigorating peppery taste of the watercress. 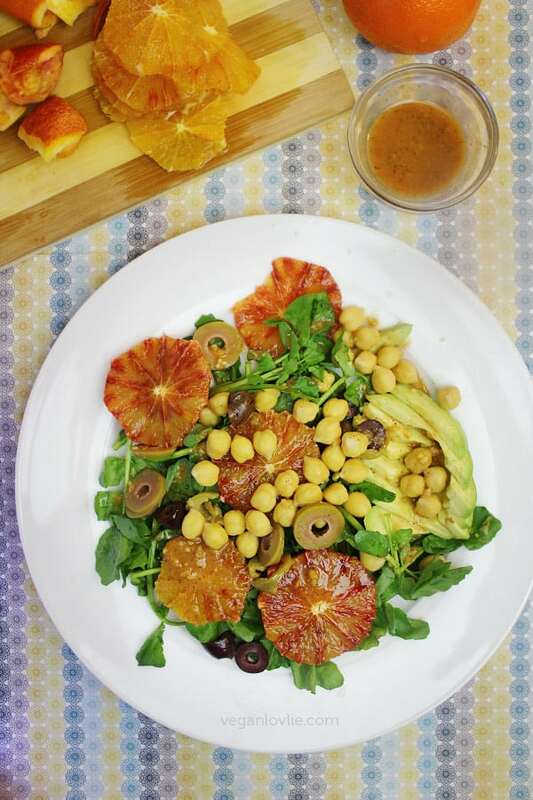 Citrussy miso dressing adds in some umami for a really beautiful range of flavours. In Canada, winter really feels like a long hibernation where I find myself stepping out of the house only when I really need to. I have even been ordering my groceries in, including the produce, for the past few months. Though the snow has not fully melted yet with a few light flakes falling every now and then, the days are getting warmer, longer. The stores have already started to stock the spring produce and some early flowers. The beginning of spring announced itself for me with the urge for a cleanse as I slowly stretch out of my coziness of winter comfort food. And what else than a marvelous green salad to enliven the taste buds with a burst of freshness. Watercress is one of those greens that I used to enjoy during my childhood in whatever way it was prepared. 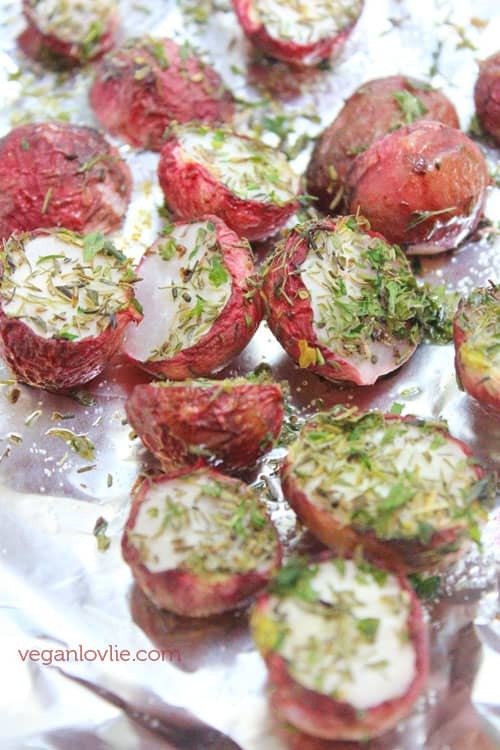 I loved it in soups, salad, lightly sauteed or even juiced. But I especially remember it as a natural remedy my mum used to make for my sister and I when we were feeling poorly. She would grind the greens and extract the juice, warm it, mix it with honey (I wasn’t vegan back then) and we would drink it. It was soothing and did help with coughs and colds. Although watercress can grow year round, I don’t quite see them in the stores all that often. But recently, they’ve appeared; I am guessing they are probably a spring produce. Also in season at the moment are blood oranges. 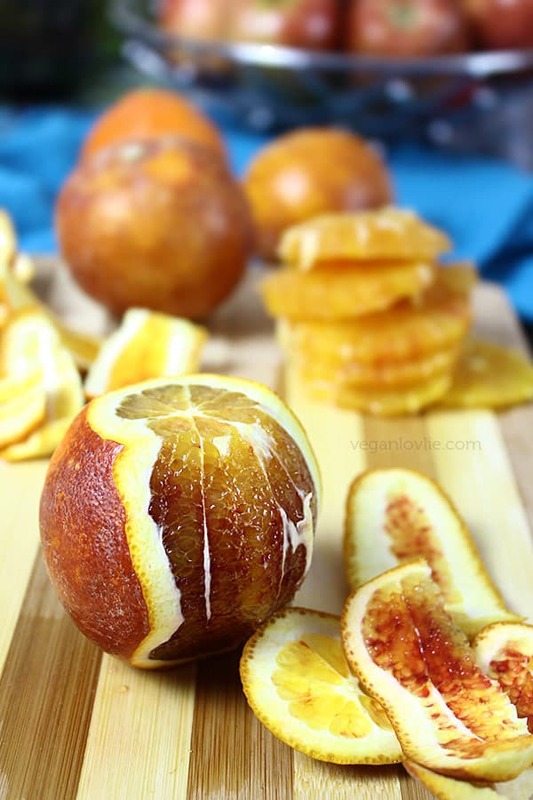 These gorgeous red fleshed citruses are so much sweeter and less acidic than normal oranges. Although a little pricier, I thought they were worth buying. I have had watercress in soup so far. You may have seen it in one of my What I Ate Wednesday videos if you are following them. But recently, I’ve been craving them raw. 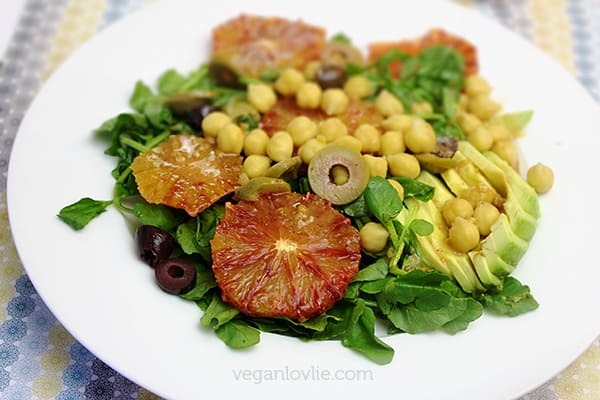 For a fantastic seasonal salad, I threw in some blood oranges, avocados, olives and some chickpeas on a bed of watercress. The sweet juicy blood orange balanced out the invigorating peppery taste of the watercress. As for dressing, I much prefer oil-free ones. So, I used some miso paste along with some of the juice of the blood oranges and a slice of lemon, all sweetened with maple syrup and brightened up with a few dashes of black pepper. Really quite bracing, this salad had the right balance of flavours. For a soy-free version, you could substitute the miso by Marmite. And you could also very well replace the maple syrup with date paste/syrup, stevia or any other sweetener of choice really. I did not use any salt as miso (or even Marmite) is salty enough for my taste; but feel free to adjust to your palate. Kevin and I had this Watercress and Blood Orange Salad for an ordinary lunch but, despite the simplicity, it was actually a very good combination. So, I am thinking of using it if I am ever having guests over or if I am bringing something over to someone’s place. The video demonstrates the easy process of making this Watercress and Blood Orange Salad with Citrus Miso Dressing. 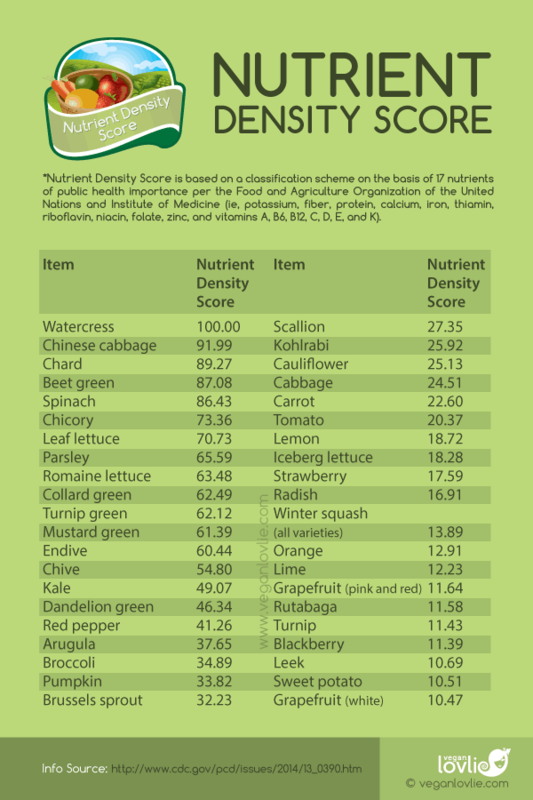 By the way, while I was researching the nutritional value of watercress and how it compares to other greens, I found that it is at the top of the list on the nutrient density scores overtaking kale, spinach and many other greens. One more reason for me to indulge in this luscious green this spring. 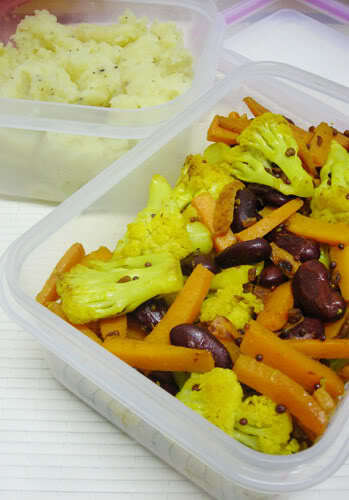 A fantastic seasonal salad with a powerhouse of nutrients and beautiful range of flavours. 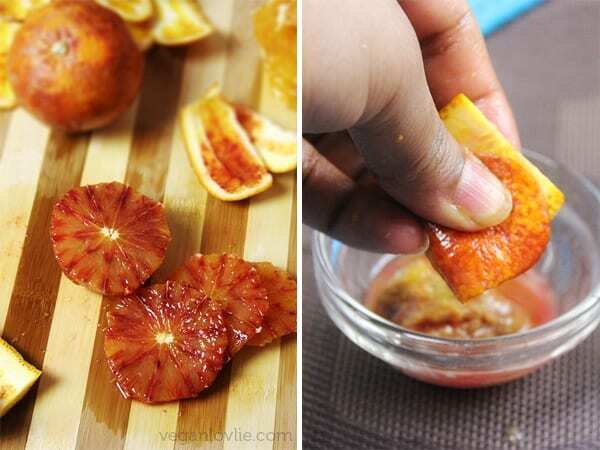 Peel the blood oranges by running a knife as close as possible to the flesh without removing too much of the pulp. Cut or slice the orange in any way you like. In a small bowl, add the miso paste. If there are any pulp in the orange peels, squeeze these into the bowl or use a slice of the orange to get some of the juice. Add the lemon juice and maple syrup. Mix everything well until smooth. Add pepper to taste. Taste for salt, acid and sweetness levels and adjust accordingly. You may arrange the salad on 2 separate plates or in a big bowl. Lay the watercress leaves on the plate/bowl. 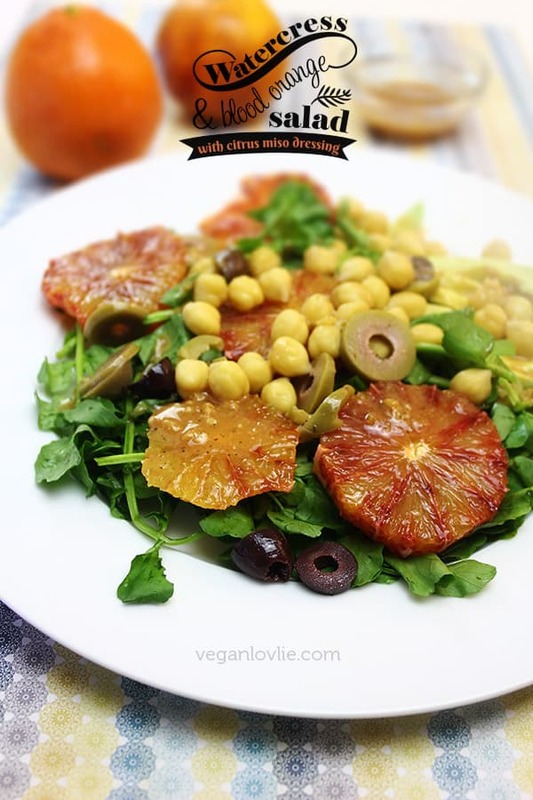 Layer on the slices of avocados, oranges, olives and chickpeas. 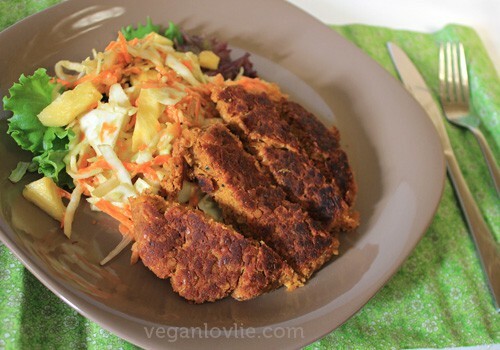 Drizzle with a few tablespoons of dressing and serve. I have to remember to eat more watercress – I really do love that stuff, especially now I know it's doing double duty on the health front. And blood oranges! Always too short a season. Thanks for reminding me about both with a lovely colourful salad.